Your smartphone is probably the best drawing device that you can conveniently carry around wherever you go. Instead of wasting paper and taking extra items with you on the go, you can just use your Android device to draw sketch or practice your favorite form of art every day. Although Android doesn’t have a built-in drawing app, but there are a plenty of third-party drawing apps available for Android phones and tablets. Whether you’re looking for a simple drawing or painting app for your kids, or you’re wanting a professional sketching app for your business or hobby, here are the some best Android apps to get you started. Sketchbook is a popular Android painting and sketching app. It provide full surface area to work. It offers 13 brushes with different sizes and color pencils. It allows you to zoom up to 2500% so that you can draw at more closer view.The app also has markers and support multi layer working to make your drawing more realistic. If you’re looking to create a detailed piece of art, then Sketchbook is the right app for you. This app also offers pro version with some additional features. These include unlimited layers, full color library, blending modes, and access to over 100 different brushes. Adobe Illustrator Draw is a mobile version of the more complex and premium Adobe Illustrator. Although the app is free, it packs a powerful punch when it comes to functionality. Users can pick from a small but versatile range of tools to draw, using vector brushes that make it easy to scale drawings as needed. 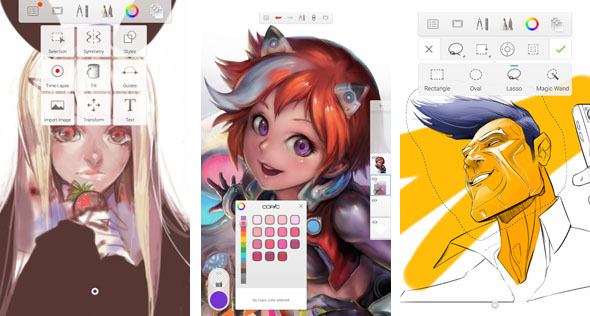 Users can also draw using layers to create fairly complex artwork, even on a small screen. The app supports stylus input, which is useful if you’re working on a phablet. You will need an Adobe account to use the app. Sketch is a great drawing app that allows you to draw stunning sketches and have fun with your photos by adding stickers. You can choose from a ton of different colors, stickers, and brushes to craft a beautiful work. You’ll also be able to choose from and manipulate different fonts to add to your sketch.Another cool feature of Sketch is it enable you to browse other people’s sketches in the gallery. There you’ll find that users have created some pretty amazing works of art with it, despite it not having a ton of features besides the basics. You can also feature your artwork from Sketch in this gallery as well, making it the perfect place to browse, find ideas from others, and even share some of your own. ArtFlow is another powerful drawing app that offers various brushes, color palettes, pencils, line style and more. It has two pop-out menus that disappear when you start painting. The menu on the top screen contains over 70 brushes, an adjustable smudge tool, eraser, paint bucket, color picker, line style, and gallery. The right side menu contains your layers and different layer functions such as merge, duplicate, rotate, etc.The app gives you the ability to export files in Photoshop’s format and support pressure sensitive pens like Samsung’s S Pen. Sketch Master is an easy to use drawing app that offers several types of sketching tools with simple user interface. The app allows users to create an unlimited number of layers with the ability to toggle visibility and opacity of these layers and even reorder them. It also gives users a choice of 7 brushes, and the ability to save and share images. While the app is quite new, it certainly doesn’t lack in functionality, and could be very useful for kids.